Abbotsford (Scottish Borders - the residence of Sir Walter Scott, illustrated here). Although a village by this name can also be found in southern England, Sydney historians attribute the name either to Sir Walter Scott's residence or to the name of Sir Arthur Renwick's estate (which probably also recalled Sir Walter). Agnes Banks - this suburb has a link with Scotland since it was named after Andrew Thompson's mother, Agnes Hilson. Andrew Thompson (1773-1810) was an emancipated convict who had been granted land on the banks of the Nepean River by Governor King in 1804. Thompson, a Scot, became well known in the Windsor area as a farmer, builder, brewer, tanner and the Chief Constable at Green Hills (later Windsor) until 1808 (Penrith City Council website). See also Scotland Island and St Andrews below. Airds (Argyll & Bute). The name of this suburb was chosen in the 1970s in order to resurrect the original name for Campbelltown. In 1810, Governor Lachlan Macquarie had named what is now Campbelltown 'Airds', in honour of his wife, Elizabeth's, family estate in Argyllshire but he changed it in 1820 to Campbelltown, Campbell being his wife's maiden name. Annandale (Dumfries & Galloway). Formerly called Johnston's Bush, this suburb was renamed to commemorate Colonel George Johnston's birthplace in Dumfriesshire, Scotland (Reed, 1973). Annangrove - According to Kennedy & Kennedy (2006), this suburb derives its name from 'Annangrove House', a residence in the locality originally belonging to a son of Colonel Johnston of Annandale (see Annandale above). Balmain and Balmain East - there is a place called Balmain in Fife. The suburb was named after William Balmain (1762-1803), who sailed with the First Fleet to establish the first European settlement in Australia at Port Jackson (now Sydney) in 1788, and who later became its principal surgeon. According to the Australian Dictionary of Biography, William Balmain was born in Scotland at Balhepburn in the Parish of Rhynd, Perthshire, to a tenant farmer (Alexander Balmain) and his second wife (Jane Henderson). Prior to his arrival in Australia, Balmain had served as a surgeon's mate on HMS Nautilus during a survey in 1784 of the coast of South West Africa (now Namibia) which the British Government was considering as a site for a convict settlement. Four years later, he sailed to Australia as a surgeon, aboard the convict ship 'Alexander'. Balmoral - this Mosman neighbourhood was named for Balmoral Castle, the royal residence built for Queen Victoria on the river Dee in Aberdeenshire. The illustration shows Balmoral Castle on a Royal Bank of Scotland £100 note. Baulkham Hills - this is one of the older place names in Greater Sydney, dating from 1802. McClymont (2003, p. 29) states that the name is attributed to one of the district's earliest free settlers, Andrew McDougall, who came from Roxburghshire in the Scottish border country. McDougall arrived as a free colonist in 1789 and named his land grant of 12 November 1799 'Roxburgh Place' and his farmhouse 'Roxburgh Hall'. There is a Buckholm Hill as well as villages called Buckholm and Old Buckholm to the north of Galashiels in the Scottish Borders. One presumes that Baulkham is a corruption of Buckholm. Blair Athol (Perth & Kinross, spelt Blair Atholl). This suburb was named for a property owned by an emigrant Scot, John Kidd, who named it after a town in Scotland (presumably the one in Perthshire). The picture above shows the Atholl countryside in Perthshire. Blairmount - there is a Blairmount Park in Dumfries & Galloway, based presumably on the Scottish family name Blair. The Campbelltown suburb was named after a property in the area owned by Clive and Victor Ducat, grandsons of a Scottish immigrant, William Ducat. Bonnie Vale - this does not appear to be a place name in Scotland or elsewhere in the UK. The name has a partly Scottish ring about it through the word 'bonnie' (meaning pleasant-looking) but 'vale' is essentially an English term. No information has been found on the origin of the name of this Royal National Park locality. Bonnyrigg (Midlothian) and Bonnyrigg Heights by association. According to the Geographical Names Board of NSW, these suburbs were named by early Scottish settlers after a village near Falkirk (presumably Bonnybridge to the west of Falkirk). One nevertheless wonders whether the true derivation was Bonnyrigg in Midlothian. Busby (East Renfrewshire and Perth & Kinross). The illustration is of the Primary School in Busby, East Renfrewshire. Busby is a Danish Viking name and possibly travelled to Scotland from North Yorkshire, where there are places called Busby Hall, House, Moor, Stoop and Wood. The suburb was actually named for Scots-born James Busby, "a pioneer wine maker who arrived in Sydney in 1824, became superintendent of the Male Orphan School near Liverpool and set the boys to work planting a vineyard and producing wine." (Geographical Names Board of NSW). Campbelltown (Argyll & Bute, spelt Campbeltown). According to Reed (1973), Governor Macquarie had originally named this suburb Airds in 1810, to recall his wife's family estate in Argyll. The Governor decided to change it in 1820 to its current name, in honour of his wife's maiden name, Campbell. Close links have been forged between the Municipality of Campbelltown and the Burgh of Campbeltown in Scotland. Campsie (Perth & Kinross). The name of this suburb is ultimately attributable to the Scott Brothers who, in 1851, acquired John Redman's farm, renaming it "Campsie Farm", presumably after the district of Campsie in Scotland, where there is also a range of hills known as the Campsie Fells. Carss Park - William Carss was a Scottish cabinet maker who came to Australia in 1831 and who purchased land on the western side of Kogarah Bay in 1860 (Geographical Names Board of NSW). Castlecrag - although the only occurrence of Castlecrag as a place name in the British Isles is in the northern English county of Cumbria (spelled Castle Crag), the name of this North Shore suburb appears to have a Scottish connection. Warne (2005, pp. 106-107) states that the renowned architect, Walter Burley Griffin, began building houses at Castlecrag in 1921. She also adds that the suburb was named after a giant outcrop of sandstone resembling a castle and that this outcrop was marked on early maps as Edinburgh Castle. Castlecrag's main road is in fact Edinburgh Road while most of the residential streets are named for features of medieval castles, such as Barbican, Battlement, Bulwark, etc. Cawdor (Highland). According to Jenny Akers (Camden History website), the name was given to the area by Governor Macquarie to honour his wife's family's connection to Scotland (the Campbells of Cawdor). The Geographical Names Board of NSW, on the other hand, states that the suburb takes its name from a property once owned by the entrepreneur and pastoralist John Macarthur (1767-1834), one of Sydney's earliest landowners. Although Macarthur was born in Devon, his parents were Scottish. Cawdor Castle is mentioned in Shakespeare's play as Macbeth's residence though the castle was built after Macbeth's reign. Claymore - this suburb was named for a property in the area called Claymore, after the battle sword used by Scottish Highlanders. 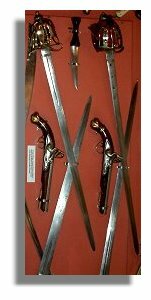 (The illustration of these two-edged swords with a basket hilt was from the collection in Abbotsford, gathered by Sir Walter Scott.) By the 1970s, the owner of this estate (Vanderbilt) had erected three mock claymores at the gates of his property. During the 1920s and 1930s, the property had been known by another Scottish name - Rosslyn. Yet another Scottish name - Glenroy - had been associated with the area for many years, but was ignored in favour of Claymore when the suburb was officially named in 1975. Clyde - the name of this Parramatta suburb as well as the Clyde Marshalling Yards in neighbouring Auburn no doubt refers to the River Clyde, which flows through Glasgow. Kennedy & Kennedy (2006) substantiate the link with Scotland by quoting a former Railway Commissioner who commented on the aptness of the name considering the proximity of the area to 'New Glasgow' and its situation on the Duck River (which the Commissioner likened to the River Clyde). There is no trace of a New Glasgow in Sydney today, making this one of the many 'lost and forgotten' Scottish place names in Australian cities. Doonside (a village in Dumfries & Galloway, SE of Dalbeattie; also an estate in Alloway, South Ayrshire, on the banks of the river Doon). According to Kennedy & Kennedy (2006), Robert Crawford (1799-1848) named his grant in this area 'Doonside' after his hometown in Scotland. Dundas and Dundas Valley (Dundas Castle, Loch and Mains in the City of Edinburgh). Dundas Castle in Edinburgh is considered to be one of Scotland's most romantic wedding venues. McClymont provides the following explanation of the origin of the names of these suburbs: "The Reverend Samuel Marsden selected 100 acres at the northern end near today's Thompson's Corner which he called Dundas Farm. The name was first used in 1799 and became official for a wider district in the 1830s when the colony followed the English pattern of dividing the land into counties and parishes. Henry Dundas was the principal Secretary of State for the Home Department in London from 1791 to 1794." (McClymont, 2001, pp. 97-98). Henry Dundas, 1st Viscount Melville and Baron Dunira (1742-1811) was admitted to the Scottish bar in 1763; he served as treasurer of the Navy from 1782 to 1783 and from 1784 to 1800. Edmondson Park - Edmondson is a Scottish surname first recorded in the Edinburgh area, where Queen Margaret of Scotland had granted land to the family. The name of this Liverpool suburb honours NSW-born John Hurst Edmundson (1914-1941), who lost his life during the Battle of Tobruk, and became the first Australian to win the Victoria Cross in WW2. (Liverpool Library notes, 19 February, 1999). Elderslie (Renfrewshire). The suburb was originally named Ellerslie after the 'Ellerslie' property owned by the English explorer John Oxley. Elderslie and Ellerslie are interchangeable names, both meaning 'the field of the elder trees' in Old English. Elizabeth Bay - this suburb has a definite connection with Scotland. Governor Lachlan Macquarie named the bay after his second wife, Elizabeth Henrietta Campbell, of Airds, a distant cousin of Macquarie (see also Airds, Campbelltown and Cawdor above). The Macquaries were married in November, 1807, at Holsworthy in the English county of Devon. The Sydney suburb of Holsworthy was named for this reason, probably by Macquarie himself. Erskine Park - Erskine is a town in Renfrewshire. Although Erskine is a decidedly Scottish family name, this suburb in the far west of Sydney was named for an Irishman, James Erskine (born 1765), whose ancestry was no doubt Scots-Irish. Erskine was a military careerist who had fought in the West Indies, Ireland and the Peninsular Campaigns and who arrived with his regiment in Sydney on the 'Matilda' in August 1817. (Geographical Names Board of NSW). 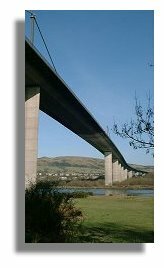 The illustration shows the Erskine Bridge across the river Clyde between West Dunbartonshire and Renfrewshire. Erskineville - there is an Erskine in Renfrewshire. According to the Geographical Names Board of NSW, the suburb took its name from 'Erskine Villa', the home of the Reverend George Erskine. Flemington (Angus, Scottish Borders and South Lanarkshire; also Flemington House and Loch Flemington in Highland, near Inverness airport). There is a Flemington in Pembrokeshire, Wales as well. Fleming is a Scottish family name dating back to the 12th century when many Flemings (people from Flanders in present-day Belgium) settled in the Scottish Lowlands. This accounts for the presence of the name in a part of Wales that was simultaneously colonised by Flemings, though Fleming never became a Welsh surname. According to Kennedy & Kennedy (2006), the Sydney suburb was named after John Fleming, an original grantee. Known originally as Liberty Plains, John Fleming was granted the land in 1806, which he appears to have called after himself (Wikipedia article on Flemington, NSW, retrieved in December 2009). Galston (East Ayrshire). Originally named Upper Dural, this semi-rural suburb was renamed Galston in 1886, after the coalmining town near Kilmarnock in Ayrshire, Scotland. Glendenning (Dumfries & Galloway, spelt Glendinning). Blacktown City Council suggested naming the suburb after William Glendenning, a butcher who had a shop in Jersey Road, Plumpton. Glendenning is a Scottish family name from the Border region. Glenmore Park - there is a Glenmore in Argyll & Bute and Highland. Although Glenmore is also found in Ireland, the name of this western suburb has a Scottish connection. The suburb takes its name from Henry Cox's estate 'Glenmore', which was completed in 1825 and named for the birthplace in Scotland of Mrs Frances Cox (née Mackenzie), Cox's wife (Penrith City website). Glenorie - according to McClymont (2003, p. 76), this suburb was named for a village in Scotland, though no such name is traceable through modern Ordnance Survey maps. Its original name was North Dural, the name being changed in 1894 to avoid postal confusion. William Blake, a local member of the community, put forward two suggestions (Hazledene and Glenorie), the Progress Association recommending Glenorie to the Postmaster General. Glenwood (Aberdeenshire). According to the Blacktown City Council website, this suburb was named in the 1940s for an historic property in the area, called Glenwood Park. The property had been previously known as Norfolk Vale (1846-1882), and Sorrento (1882-1941). It was formally recognised as a suburb in 1996. Glenwood is a popular name in many cities around the world. Although the only place in the British Isles called Glenwood happens to be in Scotland, it cannot be assumed that the Sydney suburb necessarily takes its name from Scotland. Gordon (Scottish Borders, as well as many other places throughout Scotland with Gordon as part of the name, e.g. Gordonstoun, Gordonstown and Gordonsburgh). Gordon is also the name of a place on the Isle of Man, probably having been taken there by Scottish settlers. 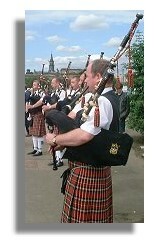 The Gordon tartan seen most frequently is the regimental tartan of the Gordon Highlanders. 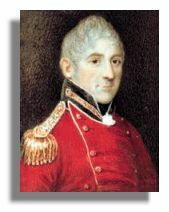 The suburb was named after Sir James Willoughby Gordon (1773-1851), a military commander during the Napoleonic Wars. It is not known whether Sir James was actually Scottish, though his name suggests that he is likely to have had some Scottish ancestry. According to the Dictionary of National Biography, Sir James was the son of a Captain Francis Grant, RN, who assumed the surname Gordon in 1768 in compliance with the terms of the will of his maternal uncle, James Gordon, of Moor Place, Hertfordshire (see also Willoughby below). Greystanes - there is a Greystane Hill in Aberdeenshire and Greystane Geo in the Shetland Islands, the only places in the British Isles where the name occurs. According to the Geographical Names Board of NSW, the suburb takes its name from a mansion built by Nelson Lawson, the third son of explorer William Lawson (1774-1850). Nelson Lawson's paternal grandparents were both Scottish, which might account for the choice of a Scottish name for his mansion. Hammondville - although Hammond does not occur as a place name in Scotland, nor is it a Scottish family name, the connection is actually more Scottish than English. According to the Geographical Names Board of NSW, the suburb was named after Canon R.B.S. Hammond who established a 'self help' community there in the depression of the 1930s. Robert Brodribb Stewart Hammond (1870-1946), Anglican clergyman, evangelist and social reformer, was born in Melbourne of Scottish parents. Hunters Hill (Aberdeenshire, spelt Hunter's Hill) also in North Yorkshire. The origin of the name of this suburb is uncertain. The suburb was probably named after Captain John Hunter, a pioneer and surveyor. However, according to an article in Volume 31, Part 5 of the Royal Australian Historical Society Journal, the name may have been given by one of the transported 'Scottish martyrs', Thomas Muir, after his father's farm in Huntershill, Glasgow. Jamisontown - There is a Jamieson Point in Dumfries & Galloway. The family name Jamison originated on the Isle of Bute, with Jamieson, Jameson and Jamison being the variants most frequently encountered. This outer western suburb was named after Thomas Jamison (c1745-1811) who was granted 1,000 acres in 1803 by Governor King. Thomas Jamison arrived with Governor Phillip as Surgeons Mate, on the First Fleet ship 'Sirius' in 1788, and became Surgeon General of NSW in 1803 (City of Penrith website). Jamison was born in County Down, Northern Ireland but both his name and his Presbyterianism strongly suggest a Scots-Irish heritage. 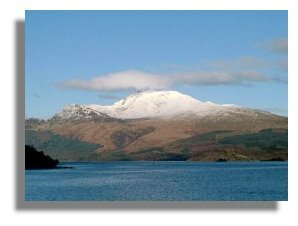 Kyle Bay - Kyle occurs frequently as an element in Scottish place names, mainly in the Highlands, some examples being Kyle of Lochalsh, Kyleakin, Kylehea and Kylesknoydart in Highland and Kylepark in South Lanarkshire. It also occurs in two northern English place names, including the river Kyle in North Yorkshire. Kyle is an anglicised form of the Gaelic 'caol', meaning a sea strait. According to the Geographical Names Board of NSW, the suburb takes its name from a land grant to an individual called Kyle. Kyle is an ancient Scottish family name first recorded in Ayrshire. Macquarie Fields, Macquarie Links and Macquarie Park - these suburbs were named in honour of Governor Lachlan Macquarie (1761-1824), "the Father of Australia", who governed New South Wales between 1809 and 1822 and who was born on the island of Ulva in the Inner Hebrides, Scotland. Governor Macquarie was an inveterate place-namer. He gave names to many places that are now included in the Sydney Metropolitan area. Some of these were definitely connected with Scotland, as indicated in this article (Airds, Campbelltown, Elizabeth Bay and possibly Ben Buckler, Cawdor, Minto and Ingleburn as well) but many were not (Bellevue Hill, Bradbury, Castlereagh, Liverpool, Penrith, Pitt Town, Richmond, Springwood, Wilberforce, Windsor and probably Holsworthy). Macquarie bestowed these latter names in some instances for purely descriptive reasons, and in other cases after places in England, local settlers, or important personalities of the day such as the Earl of Liverpool and the Duke of Richmond. It is possible that the suburb of Westmead may also have been given its name by Macquarie since it was the name of a property that he at one time owned. McCarrs Creek - Black (1996), the authority on Scottish family names, does not refer specifically to McCarr but writes under the heading 'Macara and MacCarra' that those names mean "son of the charioteer" from the Old Gaelic "ara", a charioteer. He says that the names MacAra/MacCarra are still current in Perthshire and the Macaras were classed as a sept of MacGregor and were settled in Perthshire mainly in Balquidder. Information on the origin of the name of this locality in Ku-ring-gai Chase has not been found but the name probably recalls a pioneer. Meadowbank (Aberdeenshire, City of Edinburgh and Perth & Kinross) also a town in Cheshire, England. The suburb takes its name from property owned by Surgeon William Balmain (see Balmain above) and can therefore be assumed to be a Scottish name. 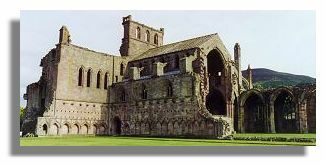 Melrose Park - Melrose is a town in the Scottish Borders - that's its abbey in the illustration. It is one of the most popular Scottish place names that have travelled to other parts of the world, possibly because of its association with Sir Walter Scott whose residence 'Abbotsford' is near the town. In Sydney's case, the connection is actually with an individual, Charles James (Jimmy) Melrose, the only solo pilot to finish the Melbourne Centenary Air Race in 1934 (Kennedy & Kennedy, 2006, p. 175). Minto and Minto Heights - Minto is a village in the Scottish Borders. The name of this suburb honours the 1st Earl of Minto, Gilbert Elliot-Murray-Kynynmound, Viceroy of India from 1807 to 1813 and who was born in Edinburgh in 1751. Some historians believe that Governor Macquarie, who was a friend of the Earl, bestowed the name. Other historians consider the choice of name to have been a politically shrewd gesture by the officers of the NSW Corps (better known as the "Rum Corps") who had deposed Macquarie's predecessor, the unpopular Governor Bligh (of 'Mutiny on the Bounty' fame/notoriety). The Earl of Minto was the most prestigious and influential representative of royalty in the region at the time. Mona Vale - there is a Mona Gowan in Aberdeenshire and Monaween in Angus. However, Mona is also the latinised Welsh name for the Isle of Anglesey and there is a Mona Hill in Norfolk, England. Of course, the Sydney suburb may simply refer to the personal name Mona. Kennedy & Kennedy (2006, p. 181) are of the opinion that "Mona Vale was named by a local farmer, J. Foley, after Mona Vale in Scotland." The whereabouts of Mona Vale in Scotland is a mystery, however. Mosman - this is normally considered to be a German or Austrian family name. In the case of the Sydney suburb, however, there is a definite Scottish connection since it was named for Scots-born Archibald Mosman, ship owner and pastoralist. Archibald Mosman (1799-1863) was born on 15 October 1799, the elder of twin sons of Hugh Mosman, of Auchtyfardle, near Lesmahagow, Lanarkshire, Scotland, and his wife Agnes, née Kennedy. Mount Annan (Dumfries & Galloway). As pointed out by the Geographical Names Board of NSW, there seem to be two possibilities to account for the name. Both involve Scotsmen, George Johnston (see Annandale above) and William Howe, who had connections with the Annandale district of Scotland. Naremburn - this name does not occur in Scotland or in other parts of the British Isles but Warne (2005, p. 123) points out that some historians believe it to be a corruption of Merrenburn, the name of an estate owned by Alexander Dodd. According to Warne, Merrenburn is a Scottish phrase meaning 'near a burn' or rock. Other historians attribute an Aboriginal meaning, from 'narra' (a fork) and 'burren' (a creek). In a communication received on 31 March 2011, from Ivan Koprivec, a Sydney-based genealogist, it was stated that the original Merrenburn estate was owned by Alexander Dodds (not Dodd, as given by Warne). Merrenburn survives as the name of a street in Naremburn. As a family name, Merren is considered to be a variant of the English family name of Mering (House of Names). It is also a girl's name. Parklea (Inverclyde). "Named by the subdividers in the early 1900s." (Blacktown City Council website). Point Piper - this suburb was named after Captain John Piper who built an expensive house on what was then known as Point Eliza. Captain Piper, a Scot of Cornish descent, arrived in Sydney as a 19-year old ensign with the New South Wales Corps in 1792. He was to become one of the most successful men in the early colony. His compatriot, Governor Macquarie, took a liking to the young captain. Captain Piper named his house Henrietta Villa for Mrs Elizabeth Henrietta Macquarie (Lawrence & Sharpe, 1999, p. 30). Rose Bay and Rose Bay North - Governor Arthur Phillip named Rose Bay after George Rose, Under-Secretary for the British Treasury (Lawrence & Sharpe, 1999, p.38). George Rose (1744-1818) was born near Brechin, Angus, Scotland and died near Lyndhurst in Hampshire, England (Thorne & Collocott, 1974). Rosebery (Midlothian). The suburb was named in honour of London-born Archibald Philip Primrose, 5th Earl of Rosebery (1847-1929), British Prime Minister in 1894 and 1895. Rosebery spent two months in Australia with his wife in 1883 and 1884 (Kennedy & Kennedy, 2006, p. 237). Rosebery is a noble Scottish title, Primrose's father, the 4th Earl of Rosebery, being a representative peer of Scotland. Rozelle (South Ayrshire - now a southern suburb of the town of Ayr). Although the name is found only in Scotland and not elsewhere in the British Isles, a Scottish connection cannot be assumed. Lawrence & Warne (1995) advance a plausible explanation of the suburb's name, speculating that it may be indirectly named for the brilliantly coloured wild native parrot, rosella (Platycereus eximius). The parrot was abundant at Rose Hill (the original name of Parramatta) and soon became known as the 'Rose Hill parrot', abbreviated to 'rosehiller' and finally 'rosella'. Rosellas were also numerous in the bay near the present suburb of Rozelle, resulting in the bay being named Rozella and finally Rozelle. One nevertheless wonders whether the Scottish village, which is near the poet Robert Burns's home, influenced the spelling of the name of this Sydney suburb. Scotland Island - According to Kennedy & Kennedy (2006, p. 245), this island suburb was named "in memory of the native land of Andrew Thompson, a former convict who was granted the land by Governor Macquarie in 1810." (see also St Andrews below and Agnes Banks above). Seaforth - there is a Loch Seaforth and Seaforth Island in the Isle of Lewis, Western Isles. The name 'Seaforth' has been made famous by the Seaforth Highlanders, a regiment of the British army that was first raised as the 72nd Highlanders in 1778 by Kenneth, last Earl of Seaforth. There is also a Seaforth in Liverpool, England, which was named for Seaforth House, the home of the Scottish merchant Sir John Gladstone (1764-1851), who was the father of Prime Minister W.E. Gladstone. The Sydney suburb may have been named for any of the above reasons, all of which have strong Scottish associations. St Andrews (Fife) though St Andrew is also honoured by place names in England and Wales. The name of this suburb has a definite Scottish connection. 'St Andrews' was the name of the property owned by Andrew Thompson, a Scotsman who had been transported in 1792 to NSW for burglary. Thompson won a pardon and later developed a close friendship with fellow Scotsman, Governor Lachlan Macquarie, naming his estate after the patron saint of their home country (see also Agnes Banks and Scotland Island above). All the streets, parks and reserves in St Andrews bear Scottish names - a decision taken in 1976 by the Campbelltown Council in order to honour the close links that had been forged between the Council and the Burgh of Campbeltown in Scotland. St Clair - no explanation has been found for the origin of the name of this suburb established in 1973. It may refer to a saint but St Clair is also the original name of the Scottish Sinclair clan. Sutherland (Highland). As explained by Curby (2004), the name of this suburb is ultimately attributable to Captain James Cook who, in April 1770 named the south point of Botany Bay after Forby Sutherland, a seaman who had died and was buried there. Hough (1994, p. 172) states that Forby Sutherland was a thirty-year-old seaman from the Orkney Islands and that he had contracted consumption shortly after 'The Endeavour' had left the Straits of le Maire, making him "the first Briton to die in Australia." The name Sutherland was adopted years later by landowner Thomas Holt for his estate and, in turn became the name of the Shire formed in 1906 and the suburb within the shire. Sutherland is therefore one of the oldest British place names in Australia and might even be the oldest Scottish name. Wallacia - According to the Penrith City Council website, the area was earlier known as Wallace, after Robert Wallace, a local grazier. At the suggestion of local residents, the name was changed to Wallacia sometime after 1890 because of the existence of another place in NSW called Wallace. In Medieval times, the Scottish surname of Wallace actually meant 'Welshman' (or more properly 'foreigner', i.e. a Briton). 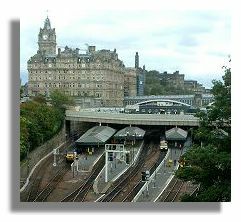 Waverley (Waverley railway station in Edinburgh (seen here), from the Sir Walter Scott novels). Although the name comes from England originally, for example Waverley Abbey in Surrey, Sydney historians attribute the name of the suburb to a private residence, Waverley House, which had been named after Sir Walter Scott's Waverley novels. It is interesting to note that the suburb of Waverley in Pretoria, South Africa took its name from the suburb in Sydney rather than directly from Scotland. Wedderburn (Aberdeenshire). The origin of the name of this suburb is a mystery to local historians. It may be a corruption of 'Widderborne', which was listed in the June 1835 Government Gazette as one of the 10 parishes included in the Campbelltown Police District. By 1848, the spelling had changed to the "Parish of Wedderburn". An indirect connection with either the town in Aberdeenshire or with the surname Wedderburn therefore cannot be ruled out. In this regard, it is relevant to note that a high proportion (32%) of the suburban names in the municipality of Campbelltown have direct or indirect connections with Scotland. Zetland (the former official name for the Shetland Islands, derived from the Old Norse name 'Hjaltland'). According to Reed (1973), the Sydney suburb was named for the Earl of Zetland, the name being chosen by Sir Hercules Robinson, Governor of New South Wales. Some of the following suburbs and neighbourhoods are also likely to have a direct or indirect Scottish connection, but these names are associated with other parts of the British Isles as well. Included in this list are places named by Governor Lachlan Macquarie but which do not necessarily refer to any particular place in Scotland. Ashfield (Argyll & Bute, Scottish Borders, Moray, South Ayrshire and Stirling) also used quite commonly in England and is found in Wales as well. What is today Ashfield was originally a farm, owned by Robert Campbell, the nephew of the highly successful Sydney merchant, Robert Campbell. Robert Campbell Senior was the youngest son of the last Laird of Ashfield in Argyllshire, Scotland. It is not certain, however, whether Ashfield owes its name to the Campbells. The name is equally, if not more likely, to have been bestowed by a subsequent owner of the farm, Joseph Underwood, who "coincidentally hailed from the parish of Ashfield in Suffolk." (Ruhen, pp. 14-16). Bellevue Hill - there are places called Bellevue in Dumfries & Galloway, Highland, the Orkney Islands and Perth & Kinross. Bellevue (meaning 'beautiful view' in French) also occurs widely in England, Ireland and Wales, sometimes spelt Belle Vue. Originally called Vinegar Hill, the name of this hill in the eastern suburbs was changed to Belle Vue in 1820 by order of Governor Macquarie. According to Reed (1973), Macquarie considered the name Vinegar Hill to be offensive because of its association with Irish political prisoners transported to Sydney after the rebellion in Ireland in 1798. Scots College is located in the suburb of Bellevue Hill. Ben Buckler - According to Reed (1960), this name is a distortion of Benbecula, which was supposedly given by Governor Macquarie. Benbecula is an island in the Outer Hebrides. Lawrence & Sharpe (1999, p. 103) point out, however, that other theories of the origin of the name have been advanced. One very plausible theory suggests that it refers to Benjamin Buckler, a convict from Yorkshire, who escaped and lived with local Aborigines for thirty years while a second theory states that it is a corruption of an Aboriginal name - 'Baal-buckaler'. Connells Point - This suburb's name could be either Scottish or Irish, depending on who it was named after. The Geographical Names Board of NSW, citing the Royal Australian Historical Society Journal, 1925, Vol. 11, p. 36, attributes the name to Sir Maurice Charles Philip O'Connell (1768-1848) who was born County Kerry, southern Ireland. Kennedy & Kennedy (2006, p. 71) on the other hand state that it was named after John Connell, a Sydney merchant who acquired land in the area in the 1830s but whose ancestry has not been reported. Connell is considered to be a Scottish name. Dean Park (Fife and Renfrewshire) also two places in England. According to the Geographical Names Board of NSW, this suburb was named after the Dean family. William Dean was granted 200 acres beside Eastern Creek and the family owned the Bush Inn on the Western Highway. The Dean family's ancestry has not been reported. Duffys Forest - Duffy is a Scottish surname, associated with Clan Macfie. However, it is also an Irish name. The Geographical Names Board of NSW states that the suburb was "possibly named after Patrick Duffy who had a grant of 100 acres west of the Pennant Hills Road." Patrick Duffy, whose ancestry has not been reported, sounds more typically Irish than Scottish. Boyce (2006), on the other hand, attributes the name to Peter Joseph Duffy, the first settler in the area. East Hills (Angus) also in Swansea, Wales, but probably a purely descriptive name in the case of this Sydney suburb. According to Kennedy & Kennedy (2006, p. 91), East Hills was first mentioned in the Sydney Gazette of 1 December 1810 as the name of a farm run by Robert Gardiner, who was a tenant of Colonel G. Johnston (the latter a Scotsman born in Dumfriesshire - see Annandale above). Forest Glen - Information on the origin of the name of this suburb in the Hornsby area has not been found but the use of the term 'glen' suggests the possibility of a Scottish connection although 'glen' has passed into Standard English. Glen Alpine - this name has a Scottish ring to it (e.g., Kenneth MacAlpin, who united the Picts and Scots) but is not found as an actual place name in Scotland. The name sounds equally Manx (there is a place called Alpine on the Isle of Man), while a reference to the European Alps is also a possibility. The Sydney suburb takes its name from the historic homestead built in the late 1820 by the Rev. Thomas Reddall, the first Anglican clergyman ever appointed to Campbelltown (Campbelltown City Council). There is nevertheless the distinct possibility of a Scottish connection. According to Scarlett (1975, p. 86), the term Alpine "is generally taken to mean a group of clans all claiming descent from Kenneth MacAlpin…." Glenhaven - there are places simply called Glen in Dumfries & Galloway, East Ayrshire, North Ayrshire, Orkney Islands and Shetland Islands, as well as two places in Ireland. In addition, there are hundreds of places in both Scotland and Ireland and a few in England and Wales with Glen as an element in the name. Glen means 'valley' in Gaelic. Glenhaven appears to be a descriptive name coined in 1892 at a public meeting to find a new name to replace the village's name (Sandhurst), which had been causing postal confusion with a place in Victoria. Part of Sandhurst was already known as 'The Haven' and the rest of the settlement was in a valley or glen (McClymont, 2003, p. 70). Ingleburn, Ingleburn Gardens and Ingleburn Village - Local historians disagree on the origin of the name. Some claim that it was named after an English farm or town. Others favour the explanation that it was coined by Governor Macquarie from the Gaelic word 'inge' meaning a 'bend' and the Scots word 'burn' meaning a stream. Lovett Bay - Lovett is a Scottish family name, one of the many variations of Lovatt. It is also an English family name, however, originating in Buckinghamshire. The Sydney suburb was named after John Lovett, a pioneer who lived in the area in 1836 (Pittswater website). 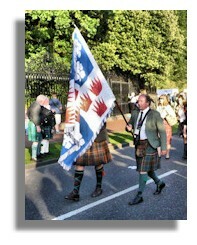 The illustration shows the standard of the Frasers of Lovat at The Gathering in Edinburgh in 2009. Mount Lewis (possibly referring to the island of Lewis, Outer Hebrides) though Lewis is also a fairly common Welsh as well as a Scottish surname. Oran Park - there is an Oran in Moray and Oransaigh in the Western Isles. Oran is also found in North Yorkshire, England while there is a village in Galway, Ireland, called Oranmore and, of course, Oran is the name of the second largest city in Algeria. There is a distinct possibility that this Camden suburb could have a Scottish connection since it takes its name from an early colonial estate owned and built in the 1830s by a John Douglas Campbell. Queens Park (City of Glasgow) also in England. Queens Park is one of Sydney's newest neighbourhoods (1992) although the suburb in which it is located (Bondi Junction) is a well-established one. It was most likely named for Queen Elizabeth (who is half Scottish through the late Queen Mother). Smeaton Grange - there is a Smeaton in East Lothian and Fife as well as a Smeaton House and Smeaton Shaw in East Lothian. The origin of the name of this suburb is just as likely to be English as Scottish, however, since the name also occurs in the west of England. According to the 'House of Names' heraldic website, the English family name Smeaton is said to be from the Musselburgh area of Lothian and is therefore ultimately of Scottish origin. The suburb of Smeaton Grange, like so many in the Camden area, takes its name from an early property. Springwood (Scottish Borders) also in Staffordshire. This suburb in the far west of Metropolitan Sydney apparently has the oldest European name in the Blue Mountains district. According to Reed (1973), there is an entry, dated 26 April 1815, in Governor Macquarie's Journal, written on his way to Bathurst, which reads: "Halted at three o'clock in a very pretty wooded Plain near a Spring of very good fresh water…I have named it Spring-Wood." 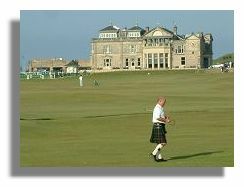 Taylors Point - Taylor is a very common surname in both Scotland and England. A survey of surnames undertaken in the 1970s suggests, however, that it is the 5th most common surname in England compared with the 14th in Scotland. Woodpark (Angus, Dumfries & Galloway and Moray) also two places in England. Yellow Rock (Argyll & Bute) also on the Isles of Scilly off Cornwall, England. Yowie Bay - Kennedy & Kennedy (2006, p. 294) point out that the name of this suburb in the Shire of Sutherland is the subject of two theories. One theory suggests that yowie is an Aboriginal word meaning 'place of echoes'. The second theory has to do with ewes. A ewe's lamb is called ewey or ewie in Scotland, and yowie in Yorkshire. Kennedy & Kennedy go on to explain that "in the Sutherland Shire, when the Honourable Thomas Holt was breeding sheep, he employed both Scottish and Yorkshire shepherds. The inlet (on the Hacking River) with its sheltered nooks where sheep had their lambs was accordingly known both as Ewie or Yowie Bay: where the lambs were born." A third category of suburban names comprises places that definitely exist in Scotland, but the likelihood that the Sydney counterpart was named for Scotland, even indirectly, is greatly diminished because these names are far more commonly associated with other parts of the British Isles. Brooklands Village (Brooklands in Dumfries & Galloway) though Brooklands is far more popularly used throughout England and is also found in south Wales. Castle Hill (Aberdeenshire, Angus, Dumfries & Galloway, Highland, Moray, North Ayrshire and South Lanarkshire) but found just as commonly throughout England and also in Wales. The suburb was probably named because of its commanding position. Governor King first made official mention of the name in 1802 (Reed, 1969). 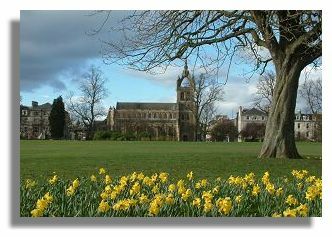 Claremont Meadows - there is a Claremont in Fife and Claremont Park in Edinburgh, but Claremont is also found as an element in place names in England, including the famous Claremont House in Surrey with its royal associations. Clare is an Irish county and it may be significant that the original estate, 'Claremont', from which the suburb took its name, was given its name by Bryan Molloy, whose own name looks distinctly Irish. Deer Park (Dumfries & Galloway, and Highland) also three places in England. Forest Lodge (Argyll & Bute, Scottish Borders, Highland and Perth & Kinross) but just as commonly found in England and is also found in Wales. Kennedy & Kennedy (2006) note that the suburb takes its name from a house called Forest Lodge built in 1836 by Ambrose Foss, a well-known chemist. Foss is an English family name of Anglo-Saxon origin, which reduces the probability of a Scottish connection. Grays Point - Gray is both a Scottish and an English family name. Kennedy & Kennedy (2006, p.116) provide the following account of the origin of the name of this southern suburb: "Grays Point NSW is the subject of two theories. The first, which is more likely, is that it was named after Samuel William Gray who owned land on the point. The second is that it was named after John Edward Gray who was a resident ranger in the National Park in the late 1800s. He was a well-known local identity." John Edward Gray (1800-1875), naturalist, was born at Walsall, Staffordshire, England. Greenfield Park - Greenfield is the name of a district of Glasgow. The name is used more frequently in England, however, and is also found in Wales. Huntleys Cove and Huntleys Point - there is a Huntley's Cave in Highland and numerous places spelt Huntly in other parts of Scotland but Huntley is also found in England. These suburbs recall an individual named A.R. Huntley "who bought land from the Crown in 1851." (Kennedy & Kennedy, 2006, p. 135). Huntley is an English family name, which lessens the probability of a link with Scotland. Kings Park (Stirling) also in England. "Originally this suburb formed part of Marayong, but with increased residential development, residents wanted a separate identity, and the developer's estate name was adopted in 1987." (Blacktown City Council website). McGraths Hill - MacGrath is a Scottish family name associated with clan MacRae. It is also very much an Irish name, however, meaning 'son of Raith', 'rath' being the Modern Irish word for 'prosperity' or 'success'. Famous Australian McGraths listed in the Australian Dictionary of Biography generally claim an Irish cultural background, which would reduce the likelihood of a Scottish connection in the case of this outer Sydney locality. 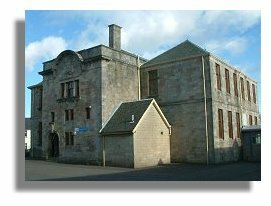 Middleton Grange - places called Middleton can be found in Aberdeenshire, Angus, Argyll & Bute, Dundee City, East Renfrewshire, Highland, Midlothian, Moray, Perth & Kinross, North Ayrshire, Renfrewshire and Stirling. However, the name occurs just as commonly throughout England and is also found in Wales. As a family name, Middleton is more English than Scottish. Miller and Miller's Point - there is a Millerhill in Midlothian plus numerous other places in Scotland with Miller as an element in the name, but this is also the case in England. The Liverpool suburb of Miller was named for Peter Miller, an early landowner, whereas Miller's Point in central Sydney was named after Mr Leighton, a miller known as "Jack the Miller." The origins of the names of these suburbs are more likely to be English than Scottish. Rosehill (Aberdeenshire, Angus, Argyll & Bute, Dumfries & Galloway, Highland, Midlothian, Moray, Orkney Islands, South Lanarkshire and Stirling) found just as commonly in England and Wales. This suburb was named after the original Rose Hill settlement, which became known as Parramatta in 1791. The present township was formed during the 1880s when John Macarthur's 'Elizabeth Farm' estate was subdivided. St Helens Park (St Helens in Scottish Borders) but also very commonly found in England including the large town to the east of the Merseyside city of Liverpool. This Campbelltown suburb was named after the Gothic mansion of St Helens Park. 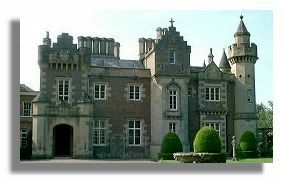 The reason for naming the mansion has not been recorded, but the fact that it is located in the Campbelltown area suggests the possibility of a Scottish connection. The Basin (Orkney Islands) also in England and Wales. Willoughby, North Willoughby and Willoughby East - The name Willoughby is found only in England but these Sydney suburbs appear to have been named for a military general and nobleman whose ancestry was quite possibly Scottish. According to Warne, 2005, p. 42), the Parish of Willoughby "was established in 1835 by proclamation and, it is generally accepted, named by Sir Thomas Mitchell, Surveyor General, for his friend, Sir James Willoughby Gordon, under whom Mitchell served during the Peninsular War." (see also Gordon above). The name Willoughby should nevertheless be regarded as an essentially English name. A final category of suburban names comprises places that can be found in Scotland, but which, in Sydney's case, definitely or most probably have no connection with Scotland. Alexandria (West Dunbartonshire). The Sydney suburb was named in honour of Princess Alexandra, wife of the Prince of Wales (later King Edward VII) whereas the town in Scotland, according to Room (2003), was named more than 100 years earlier for Alexander Smollett, the local MP for Bonhill. The connection between the name of this Sydney suburb and Scotland is therefore coincidental. Alfords Point - there is a place called Alford in Aberdeenshire. However, there are also two places in England called Alford. According to the Geographical Names Board of NSW, the suburb was named after NSW-born James Alford who owned 20 hectares of land between Georges River and Menai. This is incorrect. The suburb takes its name from the point which, in turn, was named after an emancipist, John Alford, who was transported to NSW in 1799 on the 'Royal Admiral'. John Alford, who had helped to survey the area south of Liverpool, was given several land allocations, including 100 acres on the Georges River where Alford's Point now stands. John Alford came from Willingdon, Sussex in southern England. He changed his name from Elford to Alford after arriving in NSW (information supplied by Vicki Matthews and Leone Peguero, descendants of John Alford). 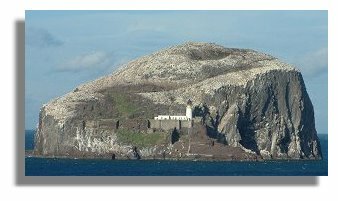 Bass Hill - there is a Bass Burn in Dumfries & Galloway Bass and a Bass Rock in East Lothian (pictured here), but places containing the element Bass are also found in England. According to Reed (1971), this suburb was named after the Englishman George Bass, naval surgeon and explorer. Beacon Hill (Dumfries & Galloway) but far more common throughout England and is also found in Wales. This is one of the oldest place names in Sydney, and is possibly derived from the use of the hill by Governor Phillip to light a fire to signal Manly across the water. "Beacon Hill is named after the trigonometric station erected on the hill and first used in 1881 by the Department of Lands. There was an allusion to a fictitious beacon on the hill." (Boyce, 2006, p. 130). Blacktown (Highland) also in Newport, Wales. According to Kennedy & Kennedy (2006) the name is purely descriptive of a settlement that grew around a school started by Governor Macquarie in 1814 for Aboriginals ('blacks') and which the Railways Department adopted for the name of a station in the 1850s. Bonnet Bay - there is a wood called Bonnet Plantation in the Scottish Borders, also Bonnethill in Moray and Bonnet Knowe in the Shetland Islands. 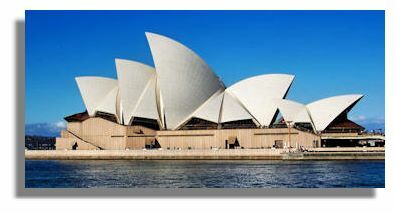 However, the name of the Sydney suburb is derived from the bonnet-shaped rock overlooking the bay and therefore has no connection with Scotland. 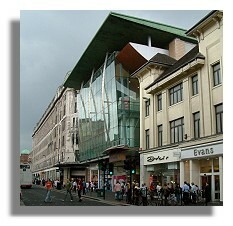 The bay was originally known as 'Old Woman's Hat' (Curby, 2004). Chester Hill (Scottish Borders, Midlothian and South Lanarkshire). Although this very English-sounding place name actually exists in Scotland but not in England, there does not appear to be a Scottish connection in the case of this Sydney suburb. The name Chester Hill is an inversion of 'Hillchester' and was chosen by Mrs H.A. McMillan after her initial proposals, Hillcrest and then Hillchester, had both failed to meet with government approval, probably because of duplication elsewhere in Australia. (Reed, 1969). Cowan - there are several places in southern Scotland that refer to Cowan (Cowans Knowe and Cowan's Croft in the Scottish Borders, Cowans, Cowan Fell and Cowan's Farm in Dumfries & Galloway, and Cowans Law in East Ayrshire). The name is also found in northern England (Cowan Bridge in Lancashire). Cowan is a Scottish family name, associated with clans Colquhoun and MacDougall. In Sydney's case, the derivation of the name is said to be Aboriginal derivation ('big water'). In this connection, the Adelaide suburb of Cowandilla and the Brisbane suburb of Cowan Cowan are both Aboriginal rather than Scottish. Crows Nest (Aberdeenshire and Dumfries & Galloway) also in England and Wales. The Sydney suburb was named after a cottage called 'Crow's Nest', built by Edward Wollstonecraft, an Englishman, who was granted 500 acres of land in the area (Reed, 1973). Davidson - there is a place called Davidson's Mains in the City of Edinburgh. However, there is also a Davidson's Burn and Davidson's Linn just over the border in Northumberland. The Davidson family tartan is shown here. Davidson is considered to be both a Scottish and an English family name. The Sydney suburb was named in memory of Sir Walter Edward Davidson, a former Governor of New South Wales (Kennedy & Kennedy, 2006, p. 82). Sir Walter Edward Davidson (1859-1923) was born at Valetta, Malta, his cultural heritage being Anglo-Irish (Australian Dictionary of Biography). Drummoyne (City of Glasgow, spelt Drumoyne). This suburb derived its name from William Wright's residence, 'Drummoyne House', which was named after his home in Ireland. Drummoyne is a Gaelic name meaning 'a flat top ridge'. Its Gaelic origin would account for the simultaneous use of the name in both Scotland and Ireland. Fairfield (Clackmannanshire, Shetland Islands and Stirling) and Fairfield East, Fairfield Heights and Fairfield West by association. Fairfield is even more commonly found throughout England and is also found in Ireland. These suburbs were named after Captain John Horsley's estate in Somerset, England and therefore have no connection with Scotland. Glebe (Highland, Orkney Islands and Shetland Islands) and Glebe Point by association; there are also three places in England called Glebe and two in Ireland. Glebe is an Old English word for land put aside for church use. This is one of Sydney's oldest place names, dating from 1789 when the Reverend Richard Johnson (1753-1827) started to clear the 400 acres granted for Church of England use by Governor Phillip, the first governor of NSW. Glenfield (Orkney Islands) also Leicestershire, England. The origin of this suburb's name is not Scottish, however. It was named for the railway station in the area which, in turn, was named for the property of an early colonial surgeon, Charles Throsby, who was born in Glenfield, Leicestershire. Harris Park (Harris is an island in the Outer Hebrides - illustrated above; also a town in Highland). Harris is also an English or Welsh surname. The suburb was named for John Harris, a pioneer surgeon who arrived in NSW in 1790. He bought 'Experiment Farm' from James Ruse, and this became part of Harris Park. (Reed, 1969). John Harris (1754-1838) was born at Moneymore, County Londonderry, Northern Ireland, and trained for the medical profession at Edinburgh University. It is possible, but by no means certain, that his ancestry may have been Scots-Irish or Anglo-Irish. Haymarket (railway station in Edinburgh) also a district in central Newcastle-upon-Tyne, England. "Haymarket recalls the cattle and corn markets that dated back to 1829 on this site before they moved to Flemington in 1975." (Kennedy & Kennedy, 2006, p.124). The name therefore appears to be a functional one, though possibly inspired by places in Britain with this name. Heathcote (Aberdeenshire) also three places in central England. Reed (1973) is of the opinion that the suburb was probably named after Heathcote in Derbyshire, England. Kingsford (Aberdeenshire and East Ayrshire) also two places in England. Kennedy & Kennedy (2006, p. 148) explain that the suburb "was known as South Kensington until it was renamed in honour of Sir Charles Kingsford Smith, the Australian pioneer aviator who was the first man to fly the Pacific Ocean." According to the Australian Dictionary of Biography, 'Kingsford', an English family name, was added to the Smith family name in Canada. Kingswood and Kingswood Park - there is a place in Perth & Kinross called Kingswood, but the name is used more frequently in England than in Scotland and is also found in Ireland and Wales. These suburbs were named after Governor Philip Gidley King's (1758-1808) family, who held land grants in the northern part of this area. Since Governor King was born in Launceston, Cornwall, the names of these suburbs clearly have no association with Scotland. Mount Vernon (City of Glasgow) also in Lancashire, England. Mount Vernon was the name of one of two land holdings owned by Anthony Fenn Kemp (1773-1868), who was born near London. The name 'Mount Vernon' found favour in many parts of the English-speaking world, probably because it was the name of President George Washington's home in Virginia, USA. A connection with the district in Glasgow therefore seems highly unlikely in the case of this Sydney suburb. Newington (City of Edinburgh, Dumfries & Galloway and Fife) but also found in England, including the well-known district in Southwark, south London. This suburb actually takes its name from John Blaxland's family estate in Kent and therefore has no connection with either Scotland or London. Newport and Newport Beach - there is a small village called Newport on the north-east coast of Scotland, south of Dunbeath. However, the name is also used in England, Ireland and Wales (Newport is Wales' third largest city and is also one of the best known towns on the Isle of Wight in southern England). According to the Geographical Names Board of NSW, the name "comes from the period when Pitt Water was the main means of transport to Sydney and a new port was established here". These suburbs were therefore named for purely functional reasons. Newtown (Aberdeenshire, Argyll & Bute, Highland, Falkirk and Shetland Islands) even more commonly found in England and, to a lesser extent, in Ireland and Wales and on the Isle of Man. The name of the suburb appears to be purely descriptive, Kennedy & Kennedy (2006, p. 201) noting that it is "attributed to one John Webster who opened a store called the New Town Store to distinguish it from stores in other localities." Oatlands (a district of the City of Glasgow) but found more commonly in England and also found on the Isle of Man. Oatlands is a relatively new suburb in the City of Parramatta, having taken its name from the historic homestead once owned by James Bettington (McClymont, 2001, p. 117). James Brindley Bettington (1796-1857), merchant and pastoralist, grew up in Lothbury, London and came to Sydney in 1827 (Australian Dictionary of Biography). A connection with Glasgow's Oatlands therefore seems improbable. Oatley - there is an Oatleycleugh in the Scottish Borders, as well as three places in England beginning with Oatley. The Geographical Names Board of NSW states that the suburb was "named after James Oatley who was holder of [the] quaintly titled office of Keeper of the Town Clock." Oatley is an English family name. Orchard Hills - there are places called Orchard in Argyll & Bute, Clackmannanshire, Dumfries & Galloway, Falkirk and Perth & Kinross. There is also a place in Devon, England called simply 'Orchard'. The Geographical Names Board of NSW considers the origin of the name to be purely descriptive, pointing out that orchards were an early feature of the locality and that many orchards still exist there. Paradise Beach - although this Sydney suburb is most likely to have been named for descriptive reasons, it is worth noting that Paradise occurs as an element in place names in both Scotland and England. Rosemeadow - The Campbelltown City Council website provides the following explanation of the origin of the name. "Contrary to the romantic image conjured up by its title, Rosemeadow was not named after some nebulous paddock of wild roses. The southern suburb of Campbelltown actually honours an early settler, Thomas Rose (1772-1836), who bought 'Mount Gilead' farm in 1818." The author of the article goes on to state that "Rose won considerable fame in the early colony for his experiments in water conservation." Thomas Rose (died 1837), who had been convicted of housebreaking and subsequently transported to NSW, was born at Newport, Shropshire, England. He became a baker, publican and water conservator. Russell Lea - Russell is both a Scottish and an English family name. The Sydney suburb has no Scottish connection, however, since it took its name from Russell Lea Manor and Russell Lea Estate built and owned by Russell Barton (1830-1916), pastoralist, mine owner and politician and who was born at Penge, which is now a suburb of Greater London. St Leonards (Scottish Borders, Edinburgh and Glasgow) also found throughout southern England. The illustration shows St Leonards-in-the-Fields church in Perth. Kennedy & Kennedy (2006, p. 242) point out that the suburb was named after the place in England of the same name by Sir Thomas Mitchell when he explored the area in 1828, and that the name originally applied to the whole of North Sydney. St Marys and North St Marys - there are places in both Moray and the Orkney Islands called St Marys but the name also occurs in England, e.g., as the name of a place in Devon, and as a district of the City of Southampton. According to Reed (1973), these suburbs were named after the local parish church of St Mary Magdalene, consecrated in 1840. The area was earlier known as South Creek. Summer Hill (East Lothian) also in England and Wales. Ruhen (1972, p. 16) points out, however, that the area was originally known as Sunning Hill, the name of the racecourse. The name Sunning Hill occurs only in England. Valley Heights - there are two places called Valley in Dumfries & Galloway and one in the Orkney Isles. There is also a place called Valley on the Isle of Anglesey, Wales, plus numerous farms in England called Valley Farm. According to Kennedy & Kennedy (2006, p. 274), Valley Heights took its name from the Valley Inn, erected in 1831 to serve travellers at Fitzgeralds Valley. By 1855, the locality surrounding the inn was known as The Valley, the name being adopted for the railway station that was built in 1875. The name was changed to Valley Heights in 1890. Victoria Park (City of Glasgow) also in England. As in the case of the many places called Victoria Park scattered around the English-speaking world, the name is most probably a direct tribute to Queen Victoria. Waterloo (Aberdeenshire, Highland, North Lanarkshire, Perth & Kinross and Shetland Islands). Waterloo is found even more commonly throughout England and is also found in Ireland and Wales. The names of all of these places, including the Sydney suburb, presumably commemorate the defeat of Napoleon at the Battle of Waterloo in Belgium in 1815. Watsons Bay - Watsons Bay was named after Robert Watson (1756-1819), quartermaster on the First Fleet flagship, HMS Sirius. According to Lawrence & Sharpe (1999, p. 60), Watson was one of three men together with Edward Laing and Thomas Laycock, to be given land grants on the peninsula in the early 1800s by Governor King. Robert Watson was born in the northern English county of Northumberland (Flynn et al, 1989). City Centre and The Rocks: Argyle Street (the Glasgow version is illustrated in the graphic), Campbell Street, Erskine Street, Hay Street, Jamison Street, Macquarie Place, Macquarie Street and Nithsdale Street. Inner Northern Suburbs: Alexander Street (Crows Nest), Anderson Street (Chatswood), Athol Wharf Road (Mosman), Burns Bay Road (Lane Cove/Hunters Hill), Carr Street (Waverton), Corrie Road (North Manly), Edinburgh Road (Willoughby East/Castlecrag), Glen Street (Mosman), Lauderdale Avenue (Fairlight), Macpherson Street (Mosman/North Cremorne), McClelland Street (Willoughby East), McLaren Street (North Sydney), Morrison Road (Putney/Tennyson Point/Gladesville), Murdoch Street (Cremorne), Seaforth Crescent (Seaforth), Stuart Street (Longueville) and Walker Street (North Sydney). Outer Northern Suburbs: Alexander Street (Collaroy), Barclay Road (North Rocks), Cameron Road (Pymble), Galston Road (Galston/Dural), Glen Street (Belrose), Haigh Avenue (Belrose), Macpherson Street (Warriewood), McCarrs Creek Road (Church Point), Pringle Avenue (Belrose), Ralston Avenue (Belrose) and Roxborough Park Road (Baulkham Hills). Eastern Suburbs: Blair Street (North Bondi), Glenayr Avenue (Bondi Beach), Glenmore Road (Paddington), Greenknowe Avenue (Elizabeth Bay), Hopetoun Avenue (Vaucluse), Macpherson Street (Waverley/Bronte), McLachlan Avenue (Paddington), Murray Street (Bronte), Robertson Road (Watsons Bay), Roslyn Gardens (Elizabeth Bay) and Watson Street (Bondi). Inner Southern Suburbs: Campbell Road (Alexandria), Campbell Street (St Peters), Campbell Street (Surry Hills), Edinburgh Road (Marrickville), Erskineville Road (Newtown), Ewart Street (Marrickville), Frazer Street (Marrickville/Dulwich Hill), Henderson Road (Eveleigh/Alexandria), Richardson Crescent (Marrickville), Swanson Street (Eveleigh) and Watson Road (Padstow). Outer Southern Suburbs: Burns Road (Picnic Point), Carson Street (Panania), Hume Road (Cronulla), Kennedy Street (Picnic Point/Panania), MacLaurin Avenue (East Hills), Nicholson Parade (Cronulla) and Sturt Road (Cronulla/Woolooware). Inner Western Suburbs: Abercrombie Street (Darlington/Chippendale), Addison Road (Petersham/Marrickville), Armstrong Street (Ashfield), Balmain Road (Leichhardt/Lilyfield), Beattie Street (Balmain), Dalhousie Street (Haberfield), Gordon Street (Lewisham), Johnston Street (Annandale), Livingstone Road (Lewisham/Petersham/Marrickville), Loch Street (Campsie), Lyons Road (Drummoyne/Russell Lea), Lyons Road West (Canada Bay/Five Dock), Patterson Street (Concord), Ramsay Street (Haberfield) and Ross Street (Glebe). Mid-Western Suburbs: Argyle Street (Parramatta), Chisholm Road (Auburn), Clyde Street (Granville/South Granville), Hamilton Road (Fairfield West), Johnston Road (Bass Hill), Macarthur Street (Parramatta), Macauley Avenue (Bankstown), Macquarie Street (Parramatta) and Sturt Street (Telopea). South-western Suburbs: Airds Road (Leumeah), Appin Road (Gilead/Rosemeadow/St Helens Park/Ambarvale), Ben Lomond Road (Minto - Scotland's Ben Lomond is shown in the graphic here), Campbelltown Road (Leumeah/Woodbine), Gilchrist Drive (Campbelltown), Henderson Road (Ingleburn), Macarthur Road (Elderslie), Macdonald Road (Ingleburn), Macquarie Avenue (Leumeah), Macquarie Grove (Camden/Kirkham/Cobbity), Macquarie Street (Liverpool), Maxwells Avenue (Sadleir/Ashcroft), Minto Road (Minto), Richardson Road (Narellan/Spring Farm), Scott Street (Liverpool), St Andrews Road (St Andrews) and Williamson Road (Ingleburn). Far Western Suburbs: Bells Line of Road (North Richmond), Burns Road (Kellyville), Christie Street (St Marys), Forrester Road (St Marys), Jamison Road (Penrith), Knox Road (Doonside), Lennox Street (Richmond), Macquarie Road (Springwood), Macquarie Street (Windsor), Maxwell Street (South Penrith), Wilson Road (Bonnyrigg Heights/Green Valley/Hinchinbrook) and Wilson Way (Blaxland). Governor Lachlan Macquarie is commemorated by no fewer than 45 avenues, circuits, drives, groves, lanes, places, roads, streets and terraces within Metropolitan Sydney. There are also at least 17 avenues, closes, courts, drives, groves, lanes, places and streets named Lachlan. Moreover, the name of one of Sydney's major universities, Macquarie University, also honours the Governor, as do the names of five parks and reserves. These are fitting tributes to one of Australia's most popular Governors and the man who has been dubbed "The Father of Australia". Geographical Names Board of New South Wales website. Penrith City Council website (Suburb Profiles). Boyce, Jim (2006). Pictorial History: Warringah. (Kingsclear Books, Alexandria, NSW). Curby, Pauline (2004). Pictorial History: Sutherland Shire. (Kingsclear Books, Alexandria, NSW). Flynn, Michael, Gillen, Mollie, and Browning, Yvonne (1989). The Founders of Australia: A Biographical Dictionary of the First Fleet. Hough, Richard (1994). Captain James Cook: A Biography. (Hodder and Stoughton, London). Kennedy, Brian and Kennedy, Barbara (2006). Australian Place Names. (ABC Books, Sydney). Lawrence, Joan and Sharpe, Alan (1999). Pictorial History: Eastern Suburbs. (Kingsclear Books, Alexandria, NSW). Lawrence, Joan and Warne, Catherine (1995). A Pictorial History of Balmain to Glebe. (Kingsclear Books, Alexandria, NSW). McClymont, John (2003). Pictorial History: Baulkham Hills Shire. (Kingsclear Books, Alexandria, NSW). McClymont, John (2001). Pictorial History: Parramatta District. (Kingsclear Books, Alexandria, NSW). Reed, A.W. (1969). Place Names of New South Wales: Their Origins and Meanings. (A.H. & A. W. Reed, Sydney). Reed, A.W. (1973). Place Names of Australia. (A.H. & A.W. Reed, Sydney). Ruhen, Carl (Editor). (1972). Ashfield 1871-1971. (Horwitz Publications, Cammeray, NSW). Stacker, Lorraine (2002). Pictorial History: Penrith & St Marys. (Kingsclear Books, Alexandria, NSW). Thorne, J.O. and Collocott, T.C. (Editors) (1974). Chambers Biographical Dictionary, Revised Edition. (W & R Chambers, Edinburgh). Warne, Catherine (2005). Pictorial History: Lower North Shore. (Kingsclear Books, Alexandria, NSW). Sydway: Greater Sydney Street Directory, Edition 15 (2009) (Sydway Publishing Company, Coogee, NSW).